During a live-streamed video of a swimming event in the Zhujiang, known in English as the Pearl River, a reporter from the Southern Metropolis Daily drank a few mouthfuls of river water to prove that it was clean. The screen capture of the livecast has gone viral on social media. In a number of media workers’ WeChat groups, journalists have called it an unprofessional and propaganda that has shamed the whole news media industry. The swim was held on July 25 near Sun Yatsen University Pier in China’s Guangzhou city at the lower course of Zhujiang. The annual event was under the theme “Everyone, Work Out and Stay Healthy” (全民健身.全民健康) and about 2,000 people participated. A number of Chinese state-affiliated media outlets featured the event and Guangzhou-based Southern Metropolis Daily broadcast it live. While doing so, the reporter said in front of the camera that the river water looked clean and transparent and drank a few mouthfuls to prove his point. 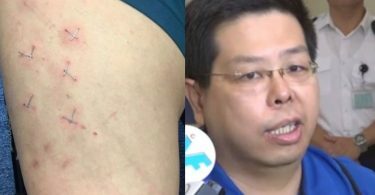 According to discussions on social media (as reported by Hong Kong online media outlet HK01), the journalist actually drank from the water three times: in his first attempt, the camera happened to move away; the second was broadcast to the public, and the third was to pose for photos. Zhujiang is the third longest river in China and its mouth is located at the most industrialized and polluted Pearl River Delta. Even though efforts were made between 2007 and 2013 to clean up the river, the water quality in the lower course of the river is still poor and far from being suitable for drinking. 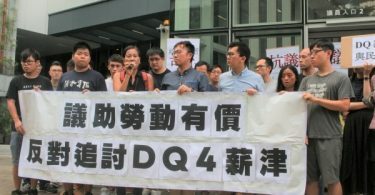 The reporter’s action has hence stirred a lot of frustration among media workers’ social circles on WeChat. In one of the groups, a reporter pointed out that Southern Metropolis Daily was one of the most critical media outlets in China just a few years back, but now it had devolved into a “positive energy” propaganda machine. Such act should not be encouraged! Journalists are not politicians, credibility is the most important thing for a media outlet. [career path]. This reporter can definitely advance in his career. Come, there is a position in the Environmental Bureau. Come take the position. Those who claimed that Zhujiang water was sweet advanced in their careers, this guy wanted to follow their example. What can he prove by eating faeces? He can prove that faeces is edible. Quite sure that he has never seen the dead rats and dead pigs floating like balloons in the river.